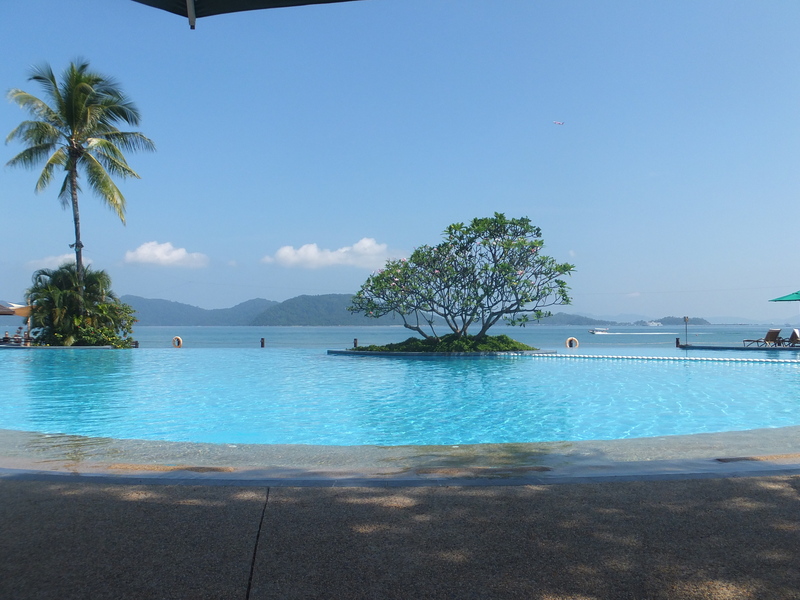 When considering Kota Kinabalu resorts go no further than Shangri La Tanjung Aru, totally LUSH! From when you step out of your taxi to the minute you check out, it is nothing short of perfect. The staff are amazingly attentive and exceptionally good with the kids. We had decided early that we would like to stay at one of the Shangri La Resorts when in Kota Kinabalu , either the Tanjung Aru or the Rasa Ria. Would just like to highlight here that nothing about this post is budget, the reason we chose to stay at the Shangri La was that it was my 40th birthday and I wanted a bit of luxury, I got it and I’m really happy with the experience but not something I could get use to considering our extended family situation and our budget. There are a number of tropical islands around Malaysia, if you are looking for something a little more exotic, many of them you have probably never heard of. We made our way over to Sandakan flying with Air Asia and visited Sepilok Rehabilitation Centre for Orangutans. This was a fantastic experience for the kids and the trip over was relatively painless. There were a couple of reasons we chose the Tanjung Aru over the Rasa Ria, firstly we got a good deal from Malaysia Holidays. 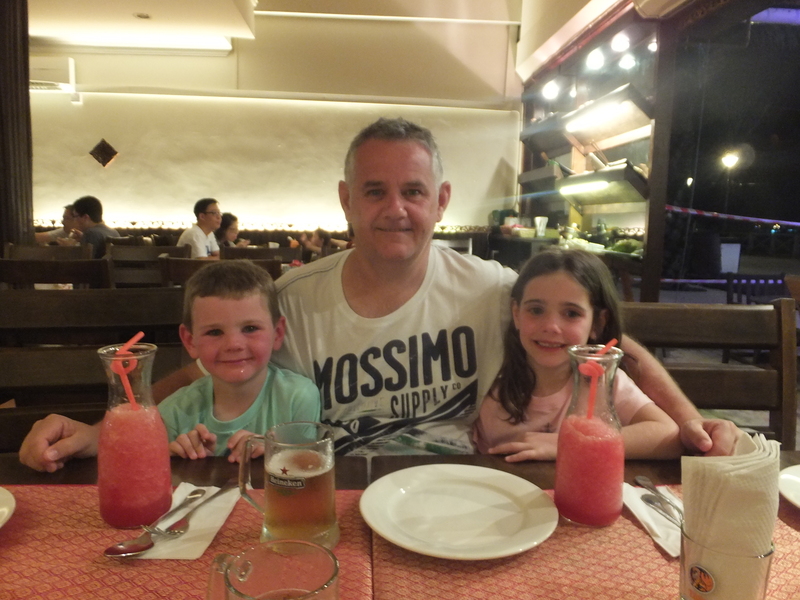 As I’ve said before the hardest thing for a family of 5 or more is the cost of accommodation, Craig found Malaysia Holidays on line and they were able to book us 2 interconnecting rooms with the second room at 50% off. The second reason was that I had read that the Tanjung Aru facilities are better for young kids. They were not wrong! he kid’s room. We had interconnecting rooms & 2 bathrooms which was handy. Both resorts are similar in there appearance and facilities, they are both 5 star and impeccably designed. All the common areas have that indoor outdoor open space feeling about them. The Rasa Ria is about 40mins drive from Kota Kinabalu, where as the Tanjung Aru is 5 mins drive from the airport and about 10 into town. 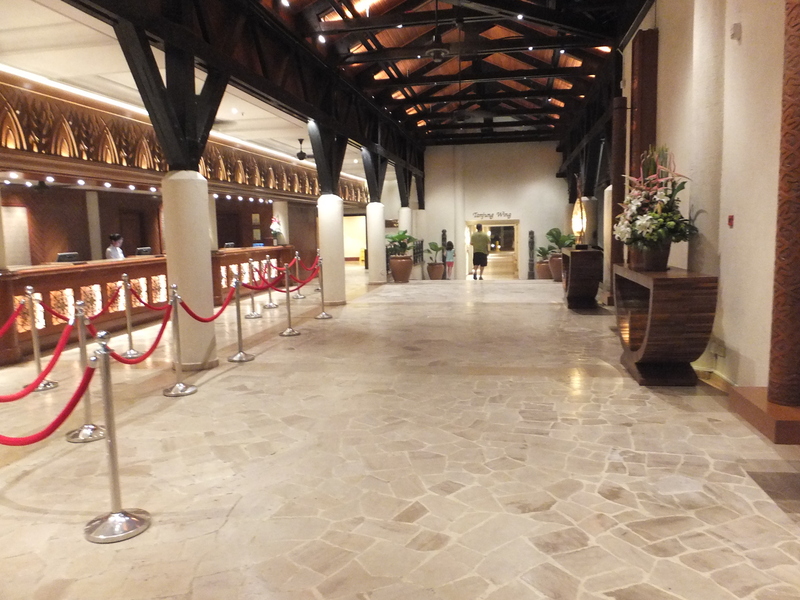 Whilst it is very close to the airport, you would not know it once you are inside the resort. There is a shuttle bus that runs daily between the resorts, it also drops off and picks up along the way in Kota Kinabalu, you are required to pay for this service though. I takes approximately 1 hour from Tanjung Aru to Rasa Ria, the return trip took an hour and a half. Keep that in mind when ordering your last mojito! As far the facilities and the look of the resorts they are much of a muchness and both live up to their 5 star rating. 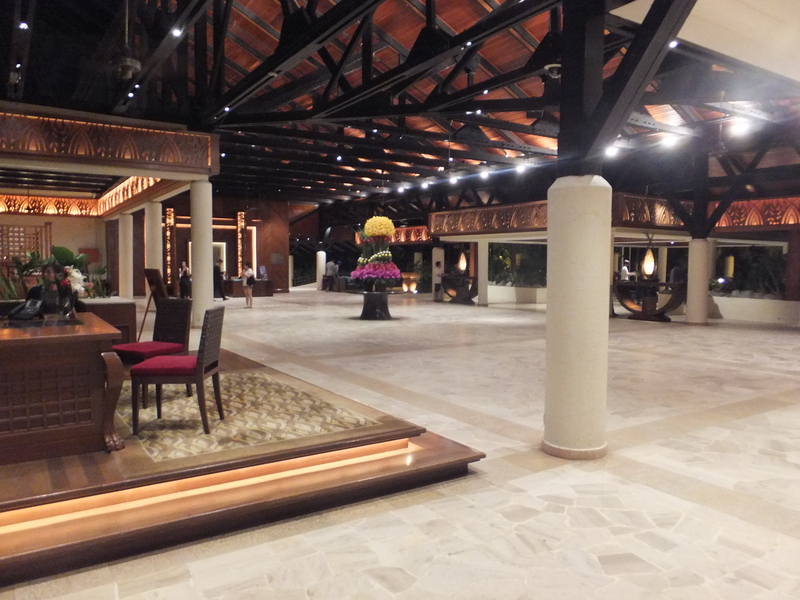 The foyer at the Shangri La Rasa Ria. Both Kota Kinabalu resorts have a kids pool area with water slides that our kids loved. The Tanjung Aru kids pool area is much larger and has an overhead water bucket which the kids also loved. The kids did enjoy the kids area at the Rasa Ria although we only spent one afternoon there. If I was to base my opinion solely on the kids pool area the Tanjung Aru would get my vote. The waterslides kept the kids entertained for most of the day, returning only for food & drinks. My infinity pool! So lush! We visited the Rasa Ria for an afternoon to visit the Nature Reserve were the young orangutans are homed until they move on to Sepilok Rehabilitation Centre to be released into the wild. The Nature Reserve holds 2 feeding times, 10am and 2pm. 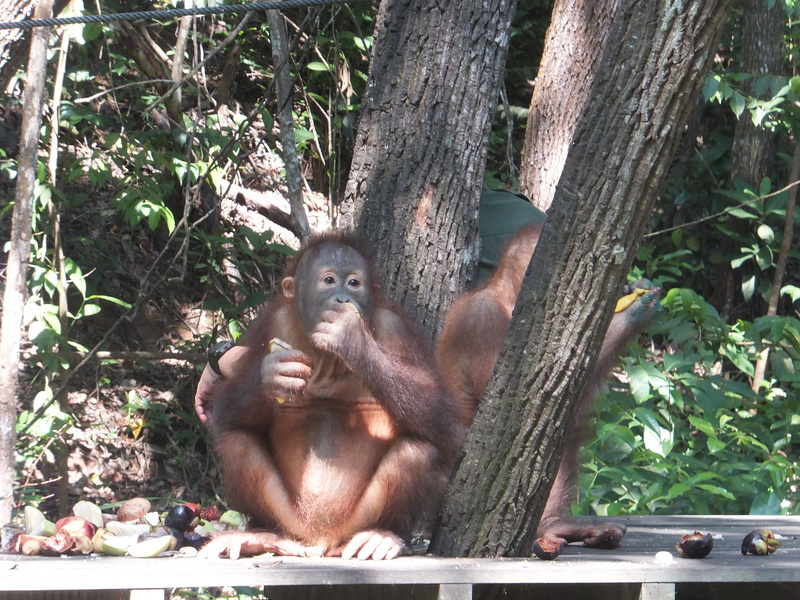 We went to the 2pm and only 2 of the 3 orang-utans arrived to eat. They didn’t stick around for long either, they grabbed a couple of pieces of fruit and left. What was entertaining were the Macaque monkeys. The orangutans must be at the top of the pecking order as they gave the macaques a couple of wacks if they come to close whilst they were eating but after the orang-utans had finished the left over fruit was fair game for the macaques. 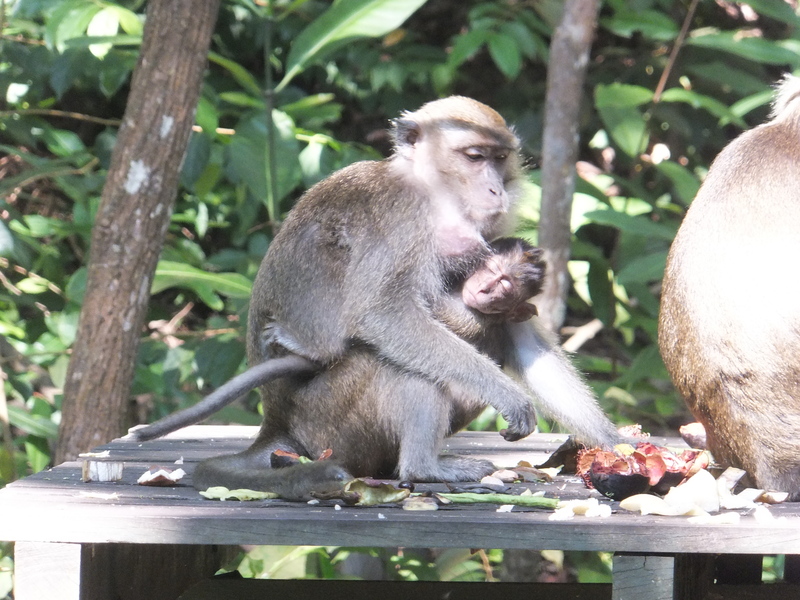 They’re greedy little fellas, we were also lucky enough to view a macaque mum and bub. Got some great photos and we all had a few laughs and just how cheeky and greedy these monkeys are for food. The Orangutans at the feeding platform at the Nature Reserve. The Macaque monkey’s very entertaining. This is a mum with bub, we were very lucky to see her. The great thing about Tanjung Aru is its location so close to town. 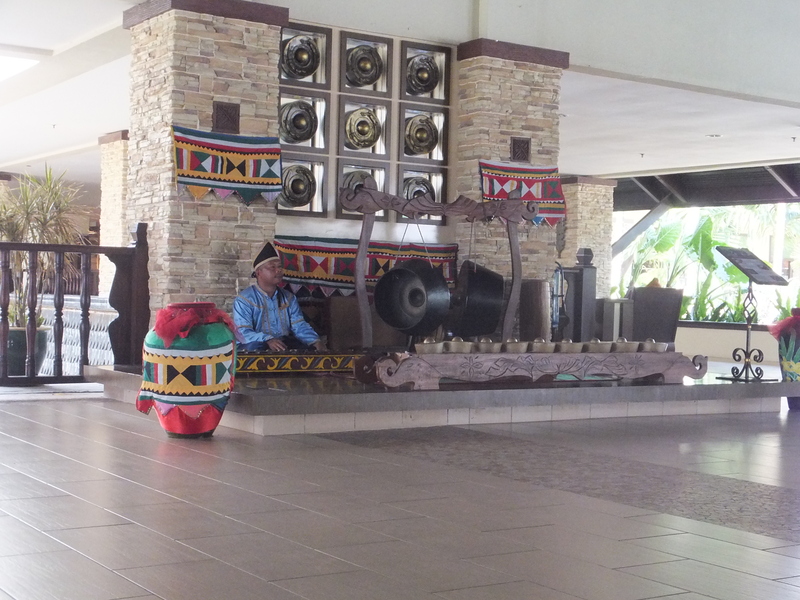 Kota Kinabalu is only a 10min from the resort, which means you are able to go into town each night and eat at the restaurants rather than eating at the resort each night which can get expensive. We went into town on the first night for Thai and on the last night to the Irish pub, with a couple we met at the pool. We put the kids in the kids club for dinner and then a babysitter picked them up, took them to the room and put them to bed until we got home. This was the first time we had done anything like a kids club and we had such a good time we were half an hour late getting back to the room. At the Thai restaurant in Kota Kinabalu on the waterfront. I know I mentioned the staff earlier but they were so good with the kids I have to mention them again! There was an employee dressed up in a different costume each morning and would entertain the kids at breakfast. Caelan had the staff carrying his plate back to the breakfast table for him. I had to remind him that he is quite capable of doing that himself! All the staff would make the effort to stop and speak with the kids and make them feel very welcome. The staff were amazing, always taking time to interact with the kids. We found that drinks and meals were actually pretty reasonably priced at the resort. We would make sure we had a big breakfast and then just a small snack in the mid afternoon and then have dinner late, after 7pm (late for the kids). Depending on where we ate in the resort, it did work out cheaper to eat at the resort than catch a taxi each way and then the meal. The kids wanted to stay in the pool until the last minute so we found it easier to stay in house. Dinner at the main buffet restaurant on the night we arrived. We stayed at the Shangri La for 5 nights and if I had my own way I would have stayed another 2. It was lush and beautiful and totally indulgent compared to what I am use to. I am thankful for the experience and understand that with a family of 5 this is not going to be our norm! The beach at the hotel. Just another photo from the Sunset Bar. 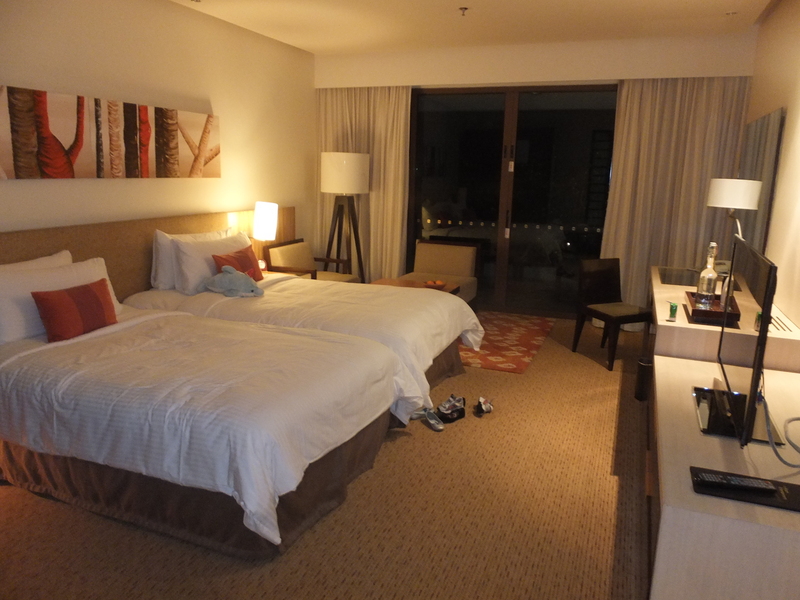 I love staying at Shangri La Resorts, its something I could easily get use to. We have had the opportunity to stay with them again at Shangri La Hotel Singapore, Shangri La Rasa Sentosa Resort and the Shangri La Kowloon. They definitely do have a special ‘Shangri La Way’ that can’t really be matched. 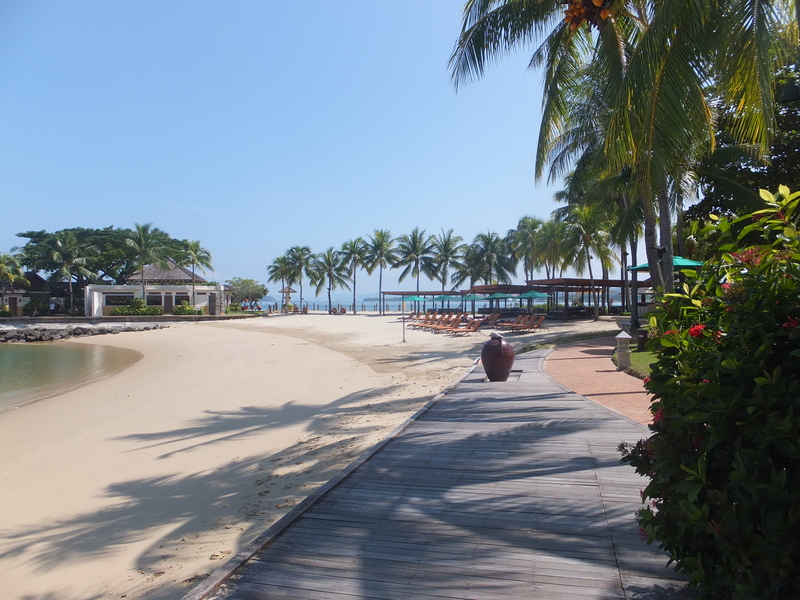 Have you stayed at either of the Kota Kinabalu resorts – Tanjung Aru or Rasa Ria? What’s your opinion? Please let your comments in the area below. Or any other hotel in Kota Kinabalu. Also please subscribe to our blog to receive regular updates on our family travels. subscribers would appreciate your work. If you’re even remotely interested, feel free to send me an e-mail. Thanks for the offer to guest post, however I’m actually really busy with my own work at the moment.